Today’s mobile workers depend on communication tools that accommodate flexible workspaces and allow free roaming wherever they are: in the office, or outside of it. Our UNIVERGE SV9000 solutions give your staff a host of smart, reliable mobile applications and devices that enhance their ability to provide quality services to your customers. NEC offers many mobility solutions designed to fit specific needs. WLAN and DECT telephones give your employees secure, crystal-clear communications as they roam about your company’s premises or anywhere else where there is coverage. Our WLAN and DECT phones also provide most of the features and functionality of a desktop phone, with additional mobile enhancements such as text messaging, alarming, programmable keys, and integration with third party applications. NEC’s Mobility features allow users to set up their phones to ring on the device of their choice. And, with the addition of SV9000 mobility applications, you can provide your employees with enhanced coverage on their mobile devices (iOS and Android) anywhere there is Wi-Fi or 4G. Employees can always be reached and seamless handover guarantees conversations continue when on the move. Callers get quick access to your emoployees, improving customer satisfaction. Powerful functionality such as corporate directory access and presence increase performance. Last but not least: easy-to-use wireless voice drastically reduces monthly cellular costs. All Business Mobility handsets offer excellent mobile voice communication: crystal clear speech, loudspeaker and hands free support, seamless handover and roaming, high security and seamless integration with features on the SV9000 platform. Appealing, ergonomic handsets deliver optimal mobility, flexibility and comfort. Powerful text and alarm messaging capabilities are provided for a wide variety of industry specific applications. With messaging, staff can be alerted about incidents such as a fire, nurse calls or status of industrial processes. Business Mobility IP DECT can be used to locate handsets and their users. This is essential if your staff needs immediate assistance from colleagues. Pushing the SOS button on the phone, the system alerts staff to the needed assistance, while automatically providing location information. Be productive from any location with NEC’s UC mobility applications. They allow you to determine how and when you want to be reached, and on what device. Single number reach and single voicemail box maximizes you and your employees’ responsiveness to colleagues and customers. 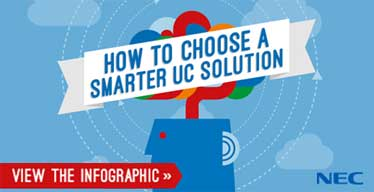 Seamlessly integrated with your UC application, it provides you access to your presence-enabled directory, contact groups and other UC functionality directly from your mobile device or web-browser. An IP DECT configuration typically consists of Access Points (APs), IP DECT system software, a DMLS open interface for messaging and DECT handsets. NEC’s AP400 Access Points connect to the IP network and form a DECT system that provides peer to peer IP communication. The connection between AP400s and the host PBX uses either a dedicated IP protocol or a SIP interface. With SIP support (SIP DECT), the IP DECT system can be linked to any certified SIP based host PBX system. Addressing an increasingly critical need for a wide range of industries. NEC's Wi-Fi solutions give organizations and their employees greater flexibility in how they respond to customers and colleagues. A preferred network for voice communications can be selected. Users with 802.11b or 802.11g networks can easily add voice communications to an existing Wi-Fi network to reduce their equipment and management costs and protect their existing investment in WLAN infrastructure. Both handsets provide protection from the interference that often handicaps other mobile systems. Should the MH150 or MH160 be deployed in a high-density or mission critical environment with existing 802.11 devices on the 2.4 GHz frequency, it can be activated in an 802.11a operating in the 5.0 GHz band. This minimizes potential interference and provides increased coverage.